What are some of the more common herbs you’ll find in beauty and skin care products? Aloe Vera - contains antioxidant and antibacterial properties; reduces redness of the skin and can help reduce wrinkles. Rose - Contains an array of vitamins, minerals, and antioxidants, as well as emollient, antiseptic and astringent properties. Chamomile - Rich in flavinoids and antioxidants, ﻿chamomile has antiseptic and anti-inflammatory abilities﻿ that help to decongest clogged pores. Mint - An abundant source of menthol with strong antibacterial properties, mint contains vitamin A and salicylic acid which helps to fight acne. Rosemary - Contains iron, calcium, and phytonutrients, anti-inflammatory benefits and antioxidants that help fight premature aging. Lavender - Lavender is known for it's soothing and healing properties, is rich in antioxidants and is an anti-inflammatory. Calendula - Calendula is rich in antioxidants like carotenoids, tocopherols (vitamin E) and contains antibacterial and anti-inflammatory benefits. 2. Weleda’s Wild Rose Spray Deodorant, 3.4 oz: This effective, non-aerosol spray eliminates the sources of unpleasant body odor and leaves a lush floral aroma. Organic rose leaf extract has mild astringent properties that refresh and tone while cleansing away impurities. 3. Bella Jade Makeup Setting spray, 4 oz: With herbal extracts of organic rooibos, white and green tea, as well as MSM and DMAE to provide vital hydration and anti-aging benefits, this makeup setting spray can be applied over your makeup to set it in place for hours or for a refreshing boost of hydration anytime. 4. Eminence Herbal Eye Makeup Remover, 5.07 oz: Cucumber, lavender, calendula and chamomile soothe and decongest even the most sensitive eyes, while green tea and comfrey protect and heal the gentle eye area. Ph balanced and ophthalmologist approved, this is a perfect compliment to your daily eye care ritual. 5. HD Beauty Cucumber + Blue Lotus Micellar Water Cleanser, 4 oz: Gentle and effective, this micellar water will cleanse skin of oils, makeup and other impurities in just one step. Exotic extracts of white water lily and Egyptian blue lotus purify, hydrate and provide potent antioxidants. 6. Moon Juice Brain Dust Herbal Supplement, 1.5 oz: An organic blend of gingko, lion's Mane, rhodiola; maca root, astragalus, ashwagandha root and stevia leaf, this proprietary blend helps combat the effects of stress to “align you with the cosmic flow for great achievement”. 7. Soothing Touch Bath and Body Oil Lavender, 8oz: This relaxing blend is infused with pure St. John's Wort and the calming essential oil of lavender, offering a fragrant tension tamer from a stressful day. Made from six vitamin-rich, deeply moisturizing oils, this Ayurvedic creation is the perfect solution to dry skin, fine lines and wrinkles. Add to your bath or smooth directly on to your body. 8. VAADI Cold Cream Cleanser with Almond Oil & Aloe Vera, (Pack of 2, 3.18 oz ea. ): A simple cold cream formula containing almond oil, aloe vera, vitamin E and honey, VAADI cold cream cleanser will protect skin from winter dryness as well as summer's harsh UV rays. 9. Palladio Herbal Lip Gloss Pink Candy: Fortified with the extracts of ginseng root, camellia oleifera leaf, ginkgo biloba, chamomilla recutita flower and aloe barbadensis leaf, this nourishing, comfortable to wear, not-too-sticky gloss provides a beautiful shiny finish that won’t slip off the lips. 10. Majestic Pure Himalayan Lychee Pink Crystal Salt Scrub, 12 oz: This scrub is pure and natural, with high-quality Himalayan salt for its maximum nutrient profile. Includes calcium, magnesium, potassium, copper & iron; no harmful chemicals; for woman and men. 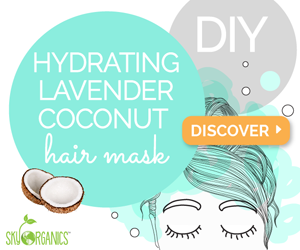 Do you use any herb-infused beauty products? Which ones are your faves? Let me know in the comments below!